Here at Inter State Artesian Well Co. Inc., we want to make sure that you have a constant supply of clean water. We achieve this by providing all the products and services needed for the maintenance of your water system. We offer custom-built water systems that are constructed with the finest materials to suit your commercial, industrial or residential water treatment needs. Our team uses high-quality parts to ensure a water system built to last. 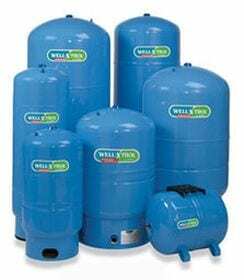 To provide you with a stable water system, we use Well-X-Trol Professional series tanks. Since 1963, tanks from Well-X-Trol are known for its notable performance and longevity. Along with its sealed air charge and unique water chamber design, Well-X-Trol remains as the most recognized brand on the market. Well-X-Trol Professional tanks were the first to meet all industry standards for quality and safety. The butyl diaphragm in all the tanks meets the Environmental Protection Agency (EPA) requirements for potable water as defined in the Safe Drinking Water Act of 1986. The entire tank which includes the virgin polypropylene liner, butyl diaphragm, and acceptance fittings for a 100% corrosion resistant water reservoir is listed by NSF International Standard 61. Another great feature about Well-X-Trol Professional series tanks is that they are offered in more options and sizes than any other well tank manufacturer. There are vertical, horizontal, in line, and underground tanks in sizes ranging from 2 gallons to 119 gallons. Whether you need tanks for installation or replacement, there’s a Well-X-Trol Professional tank for you.